I have always lived, studied and loved East London. For me, it is the single place on this island that I would ever consider home. I can easily distribute directions, name bus routes like a party trick and reveal to you hidden gems like bookshop cafes (The Hackney Pirates – thank me later). For the first time in my freelance career, I had the opportunity of working and engaging with my local community through poetry. This was as part of Apples and Snakes SPINE Festival. 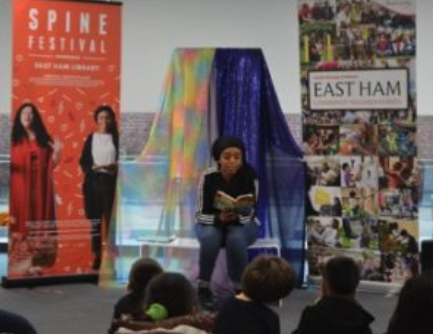 I was chosen to be one of the Resident Artists at East Ham Library, alongside internationally renowned Sri Lankan- British storyteller Debbie Guneratne. Debbie and I were based at East Ham where we were tasked with engaging local schools and residents, so they could experience East Ham Library the way the staff do: as a hub for the community. I worked closely with Debbie to plan and execute creative workshops for children, young people, adults and families, with the culmination of the festival being a celebration of the work created. I had never worked with children as young as we did, and I must admit going into it, I was terrified. 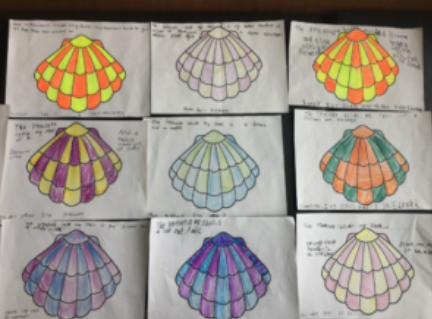 I questioned whether I had anything to ‘teach’, whether my poetry was engaging enough, whether I had ideas or the confidence to stand in front of a class of seven-year-olds. The biggest lesson I learnt in this residency; I can fake the confidence, but I can’t fake my commitment to poetry and the workshops. So, when it got to my turn to share and lead an exercise, I just made sure to have fun. During our time we’d also worked with youth groups and adult groups. These workshops were not pre-prepared like the school visits, so this was a chance to met people who were already engaging with the library. Again, the results of these workshops were outstanding. We heard stories, we chatted, we heard raps and poems and really fostered a relationship with these groups. Debbie and I met long-standing residents of East including Pam, a lady living with Bipolar disorder and Nisha, a young lady who had recently relocated from India and spends her time in the library meeting people through community sewing classes. Both Pam and Nisha expressed how much they enjoyed our session and the poems and stories shared. The culmination of the SPINE festival was the celebration and personally my favourite event. This was open to all who attended the workshops and the wider community of East Ham Library. Debbie shared stories, I shared poems. We also successfully had one person from each group we worked with attend and share their work and experience of the festival. Adrian, a young boy from the school groups read a poem about Pandas, Jessie a teen from the youth groups recited a rap about her personal standard of beauty and Pam shared a poem about her experience of SPINE. This was fulfilling to watch and my nieces and nephews got to attend. They had never seen me read before or seen me at work, and from talking to them after, they loved the whole event and wished they could’ve taken part in the Festival. Through this celebration, I realised how much the people I engage with influence my work. 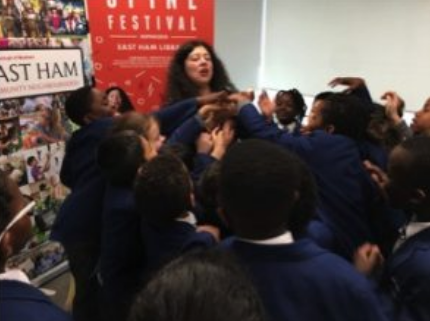 I feel humbled to have been part of the SPINE Festival, and since it’s ended, I’ve seen some of the children in the local area, one even told me they continued to write poetry and because of this I feel like the legacy of SPINE has continued, beyond Debbie and I, beyond East Ham Library, and beyond Apples and Snakes. I hope Poetry and Storytelling continues to influence the young people we worked with, which I’m sure it will, along with their engagement with the library. I wanted to give a massive thanks to Debbie for pushing me and having faith in me when I didn’t, and to all the staff at East Ham Library, including Deborah and Anna who worked intensely to make this the best experience for everyone involved. And finally a huge THANK YOU to Apples and Snakes for believing in me. To another 35 years of A&S. Photo 1 : Debbie engaging with Year 3 class. Photo 2 : Some work created by the year 3 class which includes their dream job, dream house and what treasure lies in libraries. Photo 3 : Amina reading her poetry from ‘Rising Stars’ book at the Celebration event.